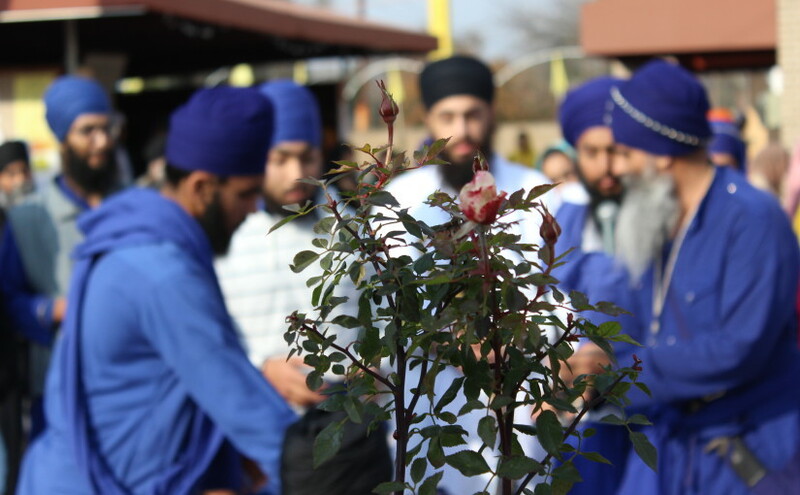 You might notice Sikhs because of their distinctive appearance, and for this reason Sikhs are often misunderstood and discriminated against in the US. As a symbol of faith and fraternity, many Sikhs do not cut their hair – men grow out their beard and wear a turban, and in traditional dress women wear scarves to cover their head. Many wear a kara, a steel bracelet that represents God’s eternal nature. Some carry a kirpan, a ceremonial dagger that represents their determination to protect themselves and defend the defenseless. But, of course, Sikhs are much more than they appear to be. Sikhs believe in one God who can be known through meditation. They value sharing, service, and equality. Their communities are built and run by the voluntary contributions of their members. The first Sikhs in the US tithed up to 50% of their monthly income towards building the first Sikh gurudwara, or temple, in Stockton, CA. Gurudwaras host community meals called langar that are open to everyone, regardless of religion. The Sikhs do not proselytize or discriminate; anyone is welcome to join the Sikh community. This was recently brought to attention by the media in Britain and other parts of the world, where many homeless find their meals at the Sikh langar service.